I just sort of went into this existential crisis of — What is The Creative Impostor? Why do I need this show? And now… I have to tell you something really strange has happened or is happening, which is that I did not plan to take a hiatus with this show. 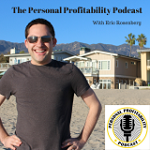 In fact over on my other podcast, Podcast Envy, all about how to craft a show that matters, I have recently advised podcasters that if they are going to take a hiatus from their show, they should tell their listeners. They should announce it. They should set some expectations so that you’re not just leaving your listeners hanging and I did NOT do that myself. Truth be told, I have been feeling guilty about it ever since I dispensed that oh so sage advice so I decided to come here just to check in and say hi. I haven’t forgotten you. I haven’t abandoned you. And I’m so so so happy and grateful that you have not abandoned me either and I know this because for some reason even though I have not released a new episode since summer, I have over a thousand downloads of The Creative Impostor per month since then — amazing!!! To share the audio clip, message me directly andrea [at] thecreativeimpostor.com by November 25th and I’ll give you instructions. So where HAVE I been and why the hiatus and what can you do if you miss me? I’m here. I haven’t disappeared. I’m producing Podcast Envy. 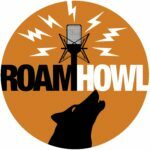 If you are interested in the topic of podcasting specifically, there’s some really good stuff happening over on that show and you should definitely subscribe. I’m also over at Power Your Story and while it’s not me, it’s my high school student mentees who are producing that show and we have a ton of new content in the pipeline. And I’ve been over at Key Change: Creating Opera For All Voices with the Santa Fe Opera. This is an integrated podcasting-opera-storytelling experience all about an initiative through the community outreach and education department at the Santa Fe Opera called Opera For All Voices, which is all about commissioning new works centered around diversity and inclusion and having the conversation about what diversity and inclusion means in the opera world and just in the arts world in the United States in general. What does American Opera mean? What does contemporary opera mean? What kinds of stories are we telling? Who is telling those stories? The first season is out now and where are in the depths of editing season 2, which will be coming out this spring. So there’s been a lot of work going on at The Creative Impostor STUDIOS and that is the primary reason for the hiatus on The Creative Impostor PODCAST. The other reason became clear to me when I went on hiatus unexpectedly was that I am getting bored. But from a business perspective, the show doesn’t really make that much sense anymore because my business has become specifically about supporting other podcasters and organizations and individuals who WANT to podcast. And so I just sort of went into this existential crisis of what is The Creative Impostor? Why do I have it? Why do I need this show? What is different about it than Podcast Envy? I keep thinking what else is possible with the medium of podcasting. What else is possible in audio? I mean, yeah, we also have. 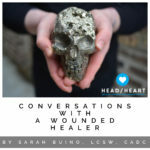 Narrative fiction podcasts like Gimlet’s Homecoming and narrative nonfiction podcasts like Serial, but there has to be something else — some kind of experimental immersive audio experience. I don’t know exactly what it is yet, but I want to do something really different. I want to be more creative to be honest. So that’s where I’m going with this. More is coming. But I don’t know what and I don’t know. Email me. 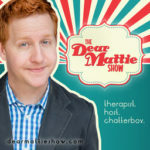 Send me an email and let me know why you listen to the show. So no like formal survey or anything. Just email me. 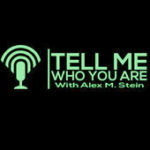 Why do you listen to the show? What do you love most about it or what do you get out of it? So that I can make sure that my new content direction is aligned with what you love and what you want and with you. If you are thinking of starting your own podcast, consider doing it together with me and a few friends in the Podcast Envy Launch Pod starting January 2019. Happy birthday to me this week Wednesday! I hope to hear from you ASAP for #podcastgratitude. I’d love to see you for real, for real via Zoom meeting in either the Launch Pod or the VIP Circle in January of 2019. Oh HEY! I’m on LinkedIn now… dropping pro podcasting tips, insights, and stories. 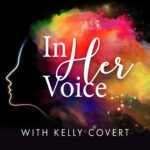 Connect with me there and let me know you’re a Creative Impostor listener. 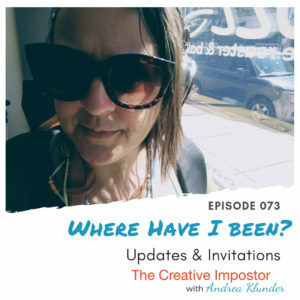 This entry was posted in Branding, Creative Impostor Podcast Episodes, Creative Process, Entrepreneurship, Featured, Impostor Syndrome, Podcast and tagged podcast, The Creative Impostor by andrea. Bookmark the permalink.